Wimbledon Champion and a member at St Albans Lawn Tennis Club. I should make it clear that I am not related to Kay but am just researching her early life while she was living in St Albans. I used to be Chairman at St Albans Tennis Club and, during my tenure in 2004, we celebrated the Clubs centenary. 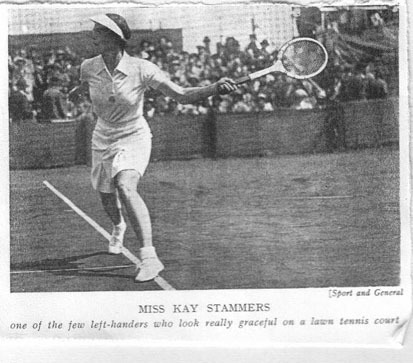 I wrote a 38 page book called "St Albans LTC - the first 100 years" and, during my research, discovered that undoubtedly our most famous member over that period had been Kay Stammers, who was a Wightman Cup Captain and two time Wimbledon ladies doubles Champion no less ! As a teenager, she won our little clubs singles and our mixed doubles before taking to the international stage and becoming famous. Kay is on our honours board having won our clubs mixed doubles championships in 1929, aged 14 or 15, with a D.H.Scott, before going on to win the clubs ladies singles championship two years later in 1931, the same year as she made her first Wimbledon appearance. I wonder if her opponent that day could have believed she was playing a future Wimbledon champion ? Her parents, Hubert and Alice Stammers, were also members at St Albans LTC for many years. Her father is also on the winners board having won the clubs mens doubles in 1933 with a Mr H.E.Wortley, later to become a chairman of the club. Hubert, Alice and Kay lived in a house called "Wood Walk" in Sandpit Lane, St Albans and, from research I did at the local library, the Stammers' owned it between 1929 and 1956. The current owner of the house is also very interested in anything I can find out about the house. I would love to discover any photo's or memorabilia of her which we could use, as having a "Wimbledon Champion" among our past members is a great talking point, and a feather in our cap compared to other club's. Undoubtedly the Club’s most famous member was Miss Kay Stammers who was England’s No1 player in the period before the Second World War. A left hander, she was, apparently, “one of the most graceful players, always a delight to watch" (from the book ‘Perry on Tennis’ by Fred Perry). As a youngster she won the Ladies Singles and the Ladies Doubles in the Club’s Championships before going on to greater things and in 1937 she was elected an honorary member of the Club in recognition of her achievements in international tennis. In the summer of 1954 the Club celebrated its 50th Anniversary and a Dinner Dance was held. A number of official guests were invited including as many of the original members who could be found. Mrs Menzies (formerly Kay Stammers) was guest of honour. A number of entertainments were organised at the Club but unfortunately these had to be curtailed on account of the weather. However, there was a costume parade, some croquet and a game of tennis played in the fashions of 1904. Kay Stammers presented prizes for the best costume. I subsequently communicated with a relative of an old member who knew Kay personally. She said "Kay - I remember her well. She lived in Sandpit Lane, we were in Clarence Road. In the 20/30s my Grandparents lived at Gorse Corner in Townsend Drive [sadly gone and now replaced by some very expensive houses]. They had a tennis court which was used by the High School and the girls – Kay, Joan Gibson, my Mum her brothers et al. Kay was a close friend of Mums. Mum was Vice President of the Herts LTA so I was lucky enough to go to Wimbledon each year and we met her there when she was over from South Africa." As Kay was obviously a junior at our Club at a time when, I imagine, juniors were not generally accepted as being of equal status to the adult members, it interests me that she should have been allowed to take part in our club tournament, however good a player. It is also interesting that in the year she took part in her first Wimbledon (June / July 1931 ?) that she should be winning our little singles event in possibly July or August 1931. Hubert Stammers’ family lived in Hackney and he married Alice Curchod from Hammersmith in 1912. They moved to 31 Glenferrie Road in St Albans and she gave birth to a daughter, Katherine, in April 1914. 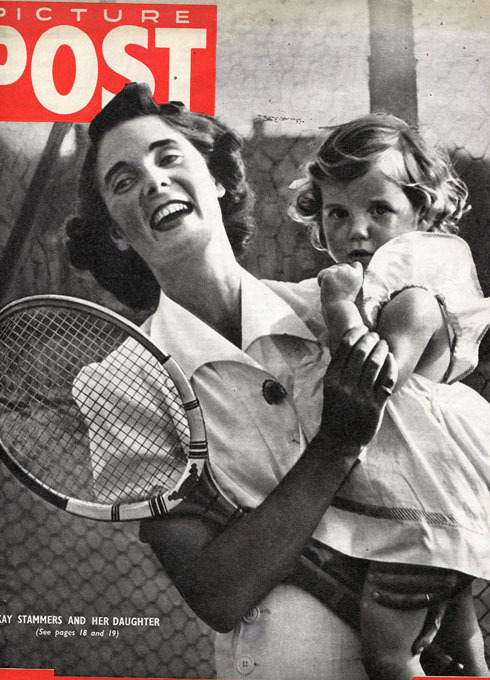 According to an article in a 1945 edition of Picture Post, "she began playing tennis at 10 years old". This would have been at the local tennis club, St Albans Lawn Tennis & Croquet Club, then in Hillside Road. When she was 14 (1928) the family moved to Sandpit Lane where her parents built a grass tennis court in their back garden. She went to the St Albans High School for Girls. She qualified for her first Wimbledon at the age of 17 (1931) and lost in round 2. It is believed she wore her hair in pigtails at the time. The earliest article I have found so far was from 1933 when Kay got to the semi final of the Hampstead Club tournament and lost 10-8, 6-2 to Miss Dorothy Round (British Wimbledon singles champion in 1934 and 1937). Contrary to the decision taken by the other British players, who decided to stay in America, Kay flew back from playing in the Wightman Cup and the US Open when war broke out. Kay married Michael Menzies a few months later and they went on to have two sons and a daughter, Virginia, born in a St Albans nursing home in 1943. During the War, Kay played exhibition matches raising money for the Red Cross and served as an ambulance driver. Kay and her husband emigrated to Johannesburg in South Africa in 1949 on account of Michael’s work and, nearly 20 years later, they moved to America, again because of work. They divorced in 1974 and a year later Kay married an American lawyer, Thomas Walker Bullitt, and went to live in Kentucky. Thomas predeceased her and she carried on living there until she died aged 91 in 2005. For as long as her health allowed, Kay returned to Wimbledon every year.